It’s an old and slightly cliché saying, but it’s absolutely true: Money doesn’t grow on trees. You work hard to earn the money you live on and that’s why it’s important to get the best possible deal when you shop for a new Toyota. Lucky for you that Everett Toyota of Paris has incredible purchase and lease specials no matter what day of the week or month you shop. It could be an outstanding low price on a new Toyota RAV4 or a big discount on the rugged Toyota Tundra. It could even be a competitive lease plan on the legendary Toyota Camry or compact Corolla. The point is that you can always take advantage of special offers at our Toyota dealership serving Sulphur Springs and surrounding areas. We can even help cut money off your monthly payment with a low interest rate. There are typically always a wide variety of finance specials available on a monthly basis at Everett Toyota of Paris. When you combine all the incentives that the factory offers with our deep discounts, you’ve got a deal that’s hard to beat. So, what are you waiting for? If you’re even thinking about getting into a new Toyota, contact us online at Everett Toyota of Paris and let us show you what kind of deal we can work for you. We’re conveniently located at 3235 NE Loop 286 Paris, TX 75460. When you shop with us, the special offers aren’t just limited to new Toyotas. You also save big on used vehicles! That’s right. Everett Toyota of Paris not only offers a large inventory of pre-owned, we also have money-saving specials on our used cars. That also includes Toyota Certified Pre-Owned vehicles. These used cars come with a factory backed warranty and a wide variety of other perks. That’s not to say that we don’t offer a great selection of other used brands, as well. In fact, if the factory makes it – we most likely have it in stock at a great price via one of our pre-owned specials. Also, here’s something else to consider: Everett Toyota of Paris even offers financing specials on used cars. That means you can forget about the great finance rates only being reserved for new car buyers when you shop with us. If you’re looking for a used car, turn to our Paris, TX used car dealership and take advantage of our amazing pre-owned specials. Finally, Everett Toyota helps you save money on the maintenance of your car, truck, van, or SUV with incredible service specials. You’ll find discounted oil changes, tire rotations, and more when you utilize our auto service center. If you want to protect your investment, keeping up with timely and preventative maintenance on your vehicle is a must. 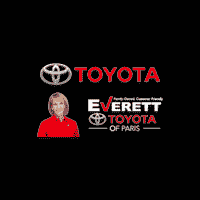 Let Everett Toyota of Paris take care of all your auto service and repair needs and save you money in the process!